A Nepalese community that grows vegetables using traditional techniques is now succumbing to population pressures and rapid urbanisation. FROM EXCELLENT vegetable growers to taxi drivers -- that's the transformation the Jyapus of Kathmandu valley are undergoing. The agricultural practices of the Jyapus, a farming community that produces most of the fresh vegetables sold in Kathmandu, exemplifies the benefits of traditional farming methods. Indra Raj Pandey, an official in Nepal's ministry of agriculture, studied the Jyapus' ingenious tradition of growing vegetables and says even today, their methods of cultivation are superior to modern farming techniques in many ways. Their techniques of cultivation have been handed down from generation to generation, with both improvements and eradication of practices. However, many of these practices are being eroded and lost today because of urbanisation and increasing population pressure. Nearly 70 per cent of the produce in Kathmandu valley comes from a rice-based vegetable production system. The vegetables are rotated with the major rice crop during the rainy season (from late June to early October). 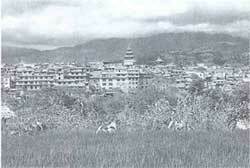 Most Jyapus in Kathmandu valley are tenants of guthi (trust) land and the farmers have to share their produce. The land is worked on mainly by family members. However, if there is a need for extra labour, families pool their resources. The unique features of Jyapu farming techniques are their methods of ploughing, crop selection and use of land, water and manure. The Jyapus seldom rear cattle. To plough fields, they dig it up with a crooked hoe, known locally as the ku (kodali in Nepali). Despite their small holdings, the Jyapus grow a large variety of vegetables on parallel strips. Many of today's modern organic farmers say mixed cropping enhances both soil and crop productivity and reduces the risk of crop failure by keeping the whole field covered and minimising moisture loss. The Jyapus have developed their own seed selection procedures for crop maintenance. They use only healthy seeds and seedlings. They always choose seeds from large and healthy plants. Many vegetable varieties common in Nepal today were improved and developed by the Jyapus from local varieties. Crops are grown on bunds and corners to increase the efficiency of land use and land is never left fallow. To get the maximum yield from a plot, the Jyapus grow short-duration crops. Immediately after a crop is harvested, the soil is prepared for the next crop. Water stagnation during rice cultivation takes a heavy toll on insects, thus helping in the cultivation of healthy vegetables during winter. Moreover, most insects are unable to breed in the chilly winter. Indigenous pesticides are sprayed occasionally to rid the farms of pests (See box). However, the use of modern agrochemicals and pesticides is increasing rapidly among the Jyapu cultivators. Because the soil in Kathmandu valley is heavy clay, an efficient drainage system is very important for vegetable cultivation, especially during the monsoon and post-monsoon months. The farmers plant vegetables that are susceptible to water on raised beds and other vegetables on sunken beds. Instead of inorganic fertilisers or even cattle manure, the Jyapus used to apply a mixture of black clay, called kalimati, agricultural wastes and human excreta. However, the use of kalimati is now banned because of the threat of workers being buried alive while digging for the clay deep below ground level. The Jyapus do not practise green-leaf manuring because their land holdings are far too small to make the preparation of such manures viable. To compensate for this, they incorporate legumes and other soil-improving varieties in their crop regimes. Jyapu elders say the abundant use of compost prevents root decay and other crop diseases. A recent trend has been the purchase of chicken manure and city wastes from private dealers and government authorities and reconditioning them for use in the fields. And, the younger generations of farmers are increasingly supplementing organic manure with chemical fertilisers, a trend many Jyapu elders are unhappy about. Besides, with the proliferation of modern toilets, the use of human excreta as manure has declined. The Jyapus, nevertheless, remain the only community in Nepal to use human excreta as fertiliser. Despite its eco-friendliness, the traditional Jyapu method of farming may soon die out. Residential areas are expanding into farm areas and the value of real estate is going up. Jyapus who own land are drawn into this vortex and sell their plots at high prices. But, instead of buying land elsewhere and continuing with farming, they use the money to open shops or restaurants or start taxi services. Another worrisome trend is that the youth of the community opt for education and would rather not take up farming. Pandey says the Jyapus techniques of cultivation, especially vegetable production, are one of Nepal's best technical assets and need to be preserved and replicated in other parts of the kingdom. The Nepalese government has paid little attention to the need to protect the vegetable belts and extend the Jyapu farming techniques to other farming communities. In addition, the Jyapus have no incentives to preserve their traditional skills and values.